Problem Solving (PS) questions are the typical multiple-choice math questions that you have seen before in school and on other standardized tests such as the SAT. A math problem is presented, followed by five answer choices, one correct and four incorrect. Calculators are not allowed, so you have to do calculations (including long-hand multiplication and division) on your scratch board. But since you have an average of two minutes per question, you are not expected to do tedious calculations. In fact, long tedious arithmetic is rarely the best approach to a problem. Many problems have multiple approaches, with one approach often faster than others. The problems are based on arithmetic, algebra, and geometry math concepts. Any of these concepts can appear as a word problem, and in fact you should expect more than half of the PS questions to be presented as word problems. There is no trigonometry or calculus on the GMAT. All numbers used are real numbers; irrational numbers are not used. Arithmetic concepts on the test include number properties, fractions, percents, ratios, exponents and roots, and basic statistics. Also included under arithmetic are certain types of word problems such as rate and work, mixture, sets, basic probability, and basic combinatorics. 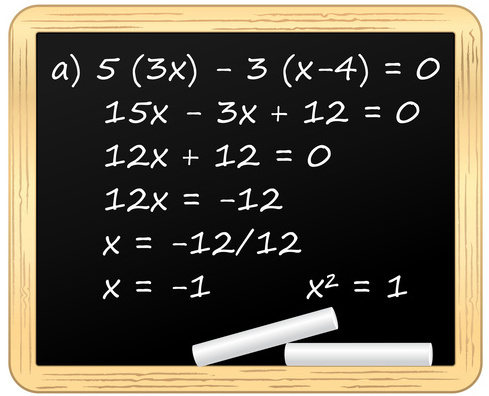 Algebra concepts on the test include solving linear equations, basic quadratic equations, and inequalities. Although most test takers see only 2 to 4 geometry questions on the GMAT, there are many types of geometry concepts that may appear: lines and angles, triangles, polygons, circles, rectangular solids and cylinders, and coordinate geometry. In approaching a problem, read the question carefully and fully understand what is asked. Harder questions are sometimes purposely worded in a confusing manner. For word problems, it is helpful to translate the information presented into equations or mathematical notation if possible. In working through the problem, make liberal use of the provided scratch board. Trying to perform calculations in your head can lead to careless mistakes. Be systematic in your approach, organize the information logically, and clearly label everything. This becomes more important as you tackle more difficult problems. Before diving into the calculations, however, be sure to examine the five answer choices for clues. Incorrect answers are typically not random numbers, but are instead created to ensnare test takers who make a careless mistake or fall into a common trap. Consider the format of the answers, so you know what you are working towards. Look for any similarities or differences amongst the available answers. If the answer choices are numbers that are far apart, perhaps some approximation will make for easier calculations. A hospital purchased 50 stethoscopes and 270 boxes of tongue depressors from a medical supply company. If the price of each stethoscope was nine times the price of each box of tongue depressors, what percent of the total bill was the price of one stethoscope? There are three general approaches to this word problem: conceptual, algebraic, and plugging-in numbers. Let’s discuss each in turn. The conceptual approach, likely to be taken by advanced students, is the fastest. Since the question focuses on the price of a stethoscope, we want to convert the total tongue depressor cost into an equivalent stethoscope cost. We know that the price of each stethoscope is nine times the price of each box of tongue depressors (side note – implicit in this statement is that all stethoscopes are equally-priced and all tongue depressor boxes are equally-priced). Thus nine tongue depressor boxes cost the same as one stethoscope. So if we divide 270 (the number of tongue depressor boxes) by nine, we know that the cost of these 270 boxes is equivalent to the price of 30 (270 ÷ 9) stethoscopes. Therefore the total bill is equivalent to the cost of 80 stethoscopes: the 50 stethoscopes bought plus 30 more (representing the 270 tongue depressor boxes). As a result, one stethoscope is of the total bill. We now need to convert this into a percent. But first let’s review the other two approaches, to make the conceptual approach more understandable. A common mistake is to write this equation backwards, as B = 9S. But since stethoscopes are more expensive, we need to make the bigger number S equal to nine times the smaller number B. A small number B cannot equal a big number S times 9. Since the question asks about stethoscopes and not tongue depressors, we want to get rid of B, the variable that we don’t care about. To do this, we need to isolate B and substitute it away. We can divide both sides of our equation by 9 (same as multiplying both sides by ). We’ll convert this into a percent after reviewing the plugging-in numbers approach. This approach is likely to be taken by less-advanced students, but is actually a great approach for this problem. When the answers represent a ratio or percent, and we don’t have specific numbers provided within the problem, then a very good technique is to pick numbers and work through the math. We know that the price of each stethoscope is nine times the price of each box of tongue depressors, so let’s pick easy numbers. We do not need to worry about whether the numbers are accurate in the real world, just whether the numbers meet the relationship described in the problem. Let’s now calculate the total bill, using the numbers we made up for the prices and the quantities provided in the problem. There are several approaches to convert into a percent. If nothing else, we could do long-hand division. But there are a couple faster approaches. Notice that . We recommend that students memorize the decimal equivalents of common fractions. So we should ideally know that = 0.125. Multiplying by is the same as moving the decimal one place to the left, so we have 0.0125. Converting a decimal into a percent is done by moving the decimal two places to the right, so 0.0125 = 1.25%. Another good shortcut takes advantage of the fact that a percent is equivalent to a fraction with a denominator of 100. So how can we turn our denominator of 80 into 100? We can increase 80 by 25%, the same as multiplying 80 by 1.25. To leave the value of our fraction unchanged, we must multiply numerator and denominator by the same number. Our correct answer has to be somewhere between 1% and 2%, leaving only answers C and D. As we have seen above, C is the correct answer.